The video embedded above was submitted to us by WPSU/Penn State Public Broadcasting. In the video, Ambassador Richard Butler, former Australian Ambassador to the United Nations, Executive Chairman of the United Nations Special Commission (UNSCOM), Chairman of the Canberra Commission on the Elimination of Nuclear Weapons, and currently distinguished scholar for international peace and security at Penn State School of International Affairs speaks about nuclear arms control and disarmament. Reference: WPSU/Penn State Public Broadcasting, "America's role in the world", Richard Butler interviewed by Patty Satalia, July 2009. The Proverbial Reset Button: Was It Pressed or Stroked in Moscow? In February, when U.S. Vice President Joe Biden said that “it’s time to press the reset button” on U.S. relations with Russia he could not have imagined what far-reaching effect his words would have. On March 6, in Geneva, U.S. Secretary of State Hillary Clinton presented Russian Foreign Minister Sergei Lavrov with a palm-sized yellow box with a red “reset button” to symbolize improved ties between the two countries. But something must have been lost in translation – the button had the Russian word peregruzka printed on it, but the Russian word for ‘reset’ is perezagruzka, while peregruzka means ‘overload’ or ‘overcharge’. 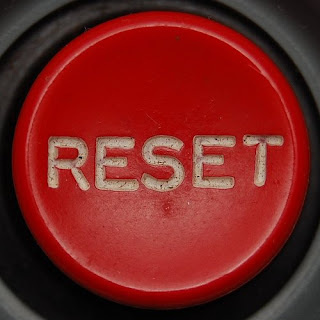 Regardless of the dodgy translation, the reset button gimmick in Geneva served its purpose as it allowed for a ceremonial rebooting of relations and expanded, as an inadvertent side effect, a rather limited list of Russian words that are well-known outside the country, such as perestroika, glasnost, vodka, matryoshka, balalaika, sputnik, gulag, and pogrom. Ever since, the word ‘reset’ (perezagruzka) has often been invoked by the Obama administration when describing what they would like to do regarding U.S.-Russian relations. “What I said coming in is that I wanted to press the reset button on relations between the United States and Russia,” President Barack Obama said in an interview with the Russian media ITAR-TASS/ROSSIYA TV on the eve of his visit to Moscow. The idea won popularity in Russia as well. On the weekend before President Obama’s visit to Russia the misspelled reset button came to light on Pushkin Square in Moscow – a ten-minute walking distance from the Kremlin – for ordinary people to press. The button was placed on a table between cardboard cutouts of presidents Obama and Medvedev. The “Reset U.S.-Russian relations” event was organized by the Russian official state newspaper Rossiiskaya Gazeta, which borrowed the button from the Russian Foreign Ministry. So, were U.S.-Russian relations really reset when Barack Obama and Dmitry Medvedev met in the Kremlin on July 6? Were the heads of the two countries able to eventually press this proverbial perezagruzka button? It appears that the summit resulted in several vital practical achievements. But at the same time it demonstrated that some substantial disagreements remain. It seems that the crisis in U.S.-Russian relations – which at the end of the Bush administration were at their worst since the 1990s – has now been overcome. The tone of bilateral dialogue has changed from confrontational rhetoric to pragmatic discussions on issues of primary concern for both nations. One of the most urgent issues before the two presidents was to achieve progress on a replacement for a vital U.S.-Russian nuclear arms control agreement – the START I treaty that expires this December. The task is a formidable one as the preparation of the START I took nine years, while a “START-Plus” treaty would only have nine months to negotiate after being effectively frozen by the Bush administration. As far as one can judge from the available information, the negotiations have encountered certain difficulties, with U.S. missile defense plans and Russian demands for sharper cuts in strategic delivery vehicles (land- and sea-based ballistic missiles and heavy bombers) presenting the key obstacles. Nevertheless in Moscow the presidents signed the Joint Understanding that outlines a new strategic arms control deal at the same time reflecting both mutual agreements and disagreements. Presidents Obama and Medvedev agreed to reduce the number of strategic delivery vehicles to 550-1,100, and the number of their associated warheads to 1,500-1,675. The specific numbers should be agreed on through further negotiations and recorded in the treaty. The warhead range of 1,500-1,675 does not look like a dramatic reduction when compared with the lower limit of 1,700 warheads of the Moscow SORT treaty signed in 2002 by presidents George W. Bush and Vladimir Putin. But the reality is that a START-Plus treaty should be concluded soon, preferably before December 2009, to preserve the verification mechanisms, which otherwise would disappear with the expiration of the START I treaty. The negotiating teams simply do not have the luxury of time to negotiate deeper cuts now. In this regard, the START-Plus treaty could be considered as an important but interim agreement preserving the continuity of the arms control and disarmament process. And, it paves the way for a next agreement that would take more time to negotiate. The wide range for delivery vehicles – from 500 to 1100 – simply reflects the distinct negotiating positions of the two countries on this issue. The United States reportedly proposed setting the limit at 1100 strategic delivery vehicles while Russia suggested a significantly lower number, probably 500 delivery vehicles. This reflects the current status of strategic forces – the last START count on 1 January 2009 shows that the United States has 1198 strategic delivery vehicles, while Russia has 814. The Russian side is already well below the proposed level of 1100 delivery vehicles, and as Russia continues decommissioning old Soviet-era weapon systems 500 seems a reasonable number for it to suggest. The presidents and their teams found a rather elegant solution when they included both suggested limits for strategic delivery vehicles in the Joint Understanding on the START follow-on treaty. But this will most certainly be an additional headache for the treaty negotiators who will have to come up with a more definite limit very soon. The number of delivery vehicles may become a major point of contention at the START-plus talks. But there are other difficult issues as well – there is no clarity regarding counting rules and verification procedures. Will a START-plus treaty follow the definitions and counting rules for strategic delivery vehicles and their associated warheads from the START I treaty or will they be modified? Will complex verification procedures from the old treaty be preserved, or will the new treaty opt for some kind of ‘verification lite’? Gary Samore, a U.S. National Security Council official for arms control, recently said that any new U.S.-Russian arms control agreement should “be free of the Cold War burden of intrusive inspections”. How then will this new START-plus treaty differ from the Moscow SORT treaty, which does not envisage any verification at all? The Joint Understanding on the START follow-on treaty acknowledges “the interrelationship of strategic offensive and strategic defensive arms”, which can be considered to be a reference to the Russian concerns with U.S. missile defense plans, especially the third missile defense site in Poland and the Czech Republic. Prior to his visit to Moscow, President Obama gave an interview to an opposition Russian newspaper Novaya gazeta, in which he said “In our meeting in London on April 1st, President Medvedev and I issued a joint statement on instructions for our negotiators for this new treaty. These instructions very explicitly did not mention missile defense as a topic of discussion for these negotiations”. The missile defenses may be another point of contention at the START-plus talks. It does not seem that the parties are going to drastically change their positions on this issue. In Moscow the presidents signed the Joint Statement on Missile Defense Issues in which they rather vaguely agreed, “to continue the discussion concerning the establishment of cooperation in responding to the challenge of ballistic missile proliferation”. It is unclear right now what practical steps could follow from this statement. Besides arms control, the United States and Russia agreed on a number of important bilateral issues that will contribute to improved relations between the two countries. For example, Russia will allow the transit of U.S. military personnel and lethal equipment through its territory to Afghanistan. The U.S. and Russian chiefs of staff agreed to resume military-to-military cooperation between the two nations. Moreover, Russia agreed to lift some restrictions on livestock trade with the United States – a market worth $1.3 billion a year. Presidents Obama and Medvedev decided to create a U.S.-Russian Bilateral Presidential Commission to serve as a new foundation for bilateral cooperation. This commission could actually be a very important development, for it provides different governmental agencies with a direct channel to their counterparts, a facility that was virtually absent during the Bush administration. An interesting thing is that the presidents decided to change the format of this new commission as compared to the Gore-Chernomyrdin commission of the 1990s, which was then co-chaired by the U.S. Vice President and the Russian Premier Minister. The new commission will be chaired by the presidents themselves and its work will be coordinated by Secretary of State Clinton and Foreign Minister Lavrov. Maybe the heads of states just didn’t want to leave the fate of their new undertaking at disposal of such “tough customers” as Joe Biden and Vladimir Putin. It may be easier to find common ground for Obama and Medvedev, who throughout their summit repeatedly emphasized that they like and trust each other. For all the upbeat public statements, a pall of disagreement over missile defense, NATO expansion and the situation around Abkhazia and South Ossetia lingered over the Kremlin hall where Obama and Medvedev had a press conference to present the results of their talks. There, President Obama reiterated his “firm belief that Georgia’s sovereignty and territorial integrity must be respected”. His respect for international law can only be admired. But why are the sovereignty and territorial integrity of Georgia more important than, say, the sovereignty and territorial integrity of Serbia? And what do we do with the Abkhazians and Ossetians who are not willing to live in one state with the Georgians after suffering through several military conflicts with them? The spar over Georgia tends to hide broader issues. These include the aspirations of Georgia and Ukraine to join NATO, and what the Russians perceive as American interference in the region. President Obama did not hint at waiving such Cold War leftover as the Jackson-Vanik Amendment which denies most-favored-nation status to Russia, and serves as a barrier to trade between the two countries. First enacted in 1974, it made normal trade relations with the Soviet Union contingent on free emigration. Russia has now allowed such freedom for years, but the amendment remains in force merely to provide Congress with political leverage over Russia. In his speech at the New Economic School President Obama said, “America wants a strong, peaceful, and prosperous Russia” and “NATO seeks collaboration with Russia, not confrontation”. Hopefully he will keep his word and practice what he preaches. The July summit of Presidents Obama and Medvedev certainly was a good start in resetting U.S.-Russian relations. Despite remaining differences it brought important practical results. The future will show whether further steps to create a new model of U.S.-Russian relations will follow. This is a guest post by Dr. Yury Yudin. Yury is a Senior Researcher at UNIDIR and manages the project ‘Multinational Approaches to the Nuclear Fuel Cycle'. His new study paper, 'Multilateralization of the Nuclear Fuel Cycle: Assessing the Existing Proposals' is available in PDF format by clicking here. Image of 'Cutler Hammer Reset Button' by J L-S retrieved from Flickr.com. Earlier this month, the Supreme Court of the Netherlands upheld the conviction of a Dutch businessman, Frans van Anraat, for being an accessory to war crimes committed by the Iraqi regime in the 1980s. It thereby confirmed in most regards a 2007 judgment by the Court of Appeal in The Hague, which had found Van Anraat guilty of being an accessory to a violation of the laws and customs of war for having 'intentionally provided the opportunity and means' for attacks with mustard gas carried out in 1987 and 1988. Between 1980 and 1988, Van Anraat had supplied Saddam Hussein's regime with at least 1'160 tons of TDG. TDG (short for 'Thiodiglycol' ) can be used to make mustard gas, a poisonous gas first used in World War I. This gas was used by Iraq in multiple attacks during the war with Iran on places in that country, as well as on the border region between Iraq and Iran, which is mainly inhabited by Kurds. Mustard gas, as well as TDG, today fall under the 1993 Chemical Weapons Convention (CWC). In the Court's view, Van Anraat knew that the TDG he supplied would be used for the production of mustard gas. Although TDG also has civilian applications, the Appeals Court considered that in the quantities as supplied by Van Anraat, the TDG could not have been used for non-military purposes. And, because Iraq was at war, Anraat was also 'very aware of the fact that – 'in the ordinary course of events' – the gas was going to be used', and that this use was actually taking place. It should be noted that Dutch export control law did not require a special license for the export of TDG until the beginning of 1985. And of course, the Chemical Weapons Convention only entered into force in 1997. The 1925 Geneva Protocol certainly prohibited the use of mustard gas in war, but it said nothing about the possession, production or transfer of chemical weapon precursors. In addition, it was arguably only applicable in international armed conflicts, (although the customary international law norm against chemical weapons use was possibly already broader in scope and applied also to internal armed conflicts). Van Anraat did not commit war crimes himself, nor did he supply the weapons with which they were committed. He 'only' furnished a precursor thereof (although an essential one) - a chemical moreover, that has legitimate civilian applications. Nevertheless, Van Anraat was convicted of a crime (a separate civil case will also be brought against him by victims of the attacks) because the Court found that 'it is beyond doubt that the regime in Bagdad...committed extensive and extremely gross violations of the international humanitarian law' – violations, to which Anraat made a 'conscious' and 'substantial contribution'. 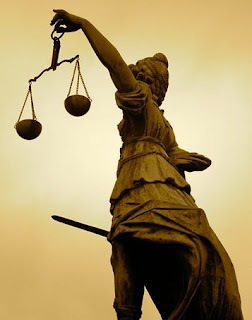 In finding that serious violations of the laws of war had been committed, the Court did not exclusively base itself on the fact that a prohibited weapon had been used. Therefore, this judgment should also be of interest to persons trading in other types of weapons, including small arms and light weapons (SALW). The judgment sets another important precedent for holding criminally responsible persons who transfer arms that are likely to be used to commit gross violations of human rights law or serious violations of international humanitarian law. Hopefully, a future Arms Trade Treaty will ensure greater accountability in the international arms trade. Photo Credit: Adapted from 'Justitia in Frankfurt' by chaouki on Flickr. Gerechtshof 's-Gravenhage (Court of Appeal The Hague), Judgment, 9 May 2007, LJN: BA6734. Hoge Raad der Nederlanden (Supreme Court of the Netherlands), Judgment, 30 June 2009, LJN: BG4822. Solferino, 24 June, 1859 : A tiny village in undulating countryside, just south of Lake Garda. Close by, a swirling, intense territorial battle involving troops from Piedmont, Sardinia and France confronting Austria’s army. Ten hours of volleys of cannon fire, cavalry charges and hand-to-hand fighting among almost 250,000 soldiers. 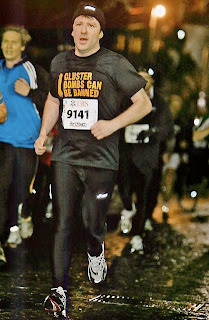 The aftermath – more than one-tenth of them dead or wounded. This bloody event one hundred and fifty years ago has had many consequences. In territorial terms, the Franco-Sardinian victory paved the way for Italian unity and for defining Italy’s northern frontiers from east to west. In humanitarian terms, the conflict has similarly had a profound and enduring impact. A witness to the distress of the wounded arriving in great numbers in the neighboring village of Castiglione delle Stiviere, was Henry Dunant. Appalled by the lack of medical facilities and relief for the wounded, this Swiss entrepreneur (who was in the area on business) rallied support for them irrespective of their military allegiances. Soon, he was to be instrumental in founding the Red Cross. Dunant, in effect, drew attention away from a popular perspective of the ‘glory’ of war to a down-to earth viewpoint of the victim. In the words of ICRC historian François Bugnion: ‘But what was important was not his [Dunant’s] personal role in Castiglione, but rather the two ideas he drew from this experience: the creation of voluntary relief societies – the birth of the Red Cross – and a treaty protecting medical staff on the battlefield – the start of the Geneva Conventions’. These treaties also embody Dunant’s spirit of neutrality and impartiality in tending to victims of war. Red Cross/Red Crescent volunteers from all round the globe gathered in Solferino last week to mark the 150th anniversary of the battle. An estimated thirteen thousand of them, red candles in their hands, symbolically traced steps that the victims had followed in desperate search for medical attention – medical attention that had been both inadequate and unprotected on the battleground on that horrific day in June 1859. It may be an exaggeration to say that the surge of 13,000 volunteers thronging through the archways of Solferino’s Piazza Castello last Saturday night evoked scenes in that same square a century and a half ago. But it was impossible not to be moved by the commemoration. The terrors and consequences of face-to-face, soldier-to-soldier warfare exhibited in Solferino’s small museum and ossuary – the bayonets, the swords, the chilling array of skulls and bones – speak silently and grimly to us still about mortal combat as they have done in other parts of the world. And the other victims of conflict: the civilians? The Battle of Solferino, by some accounts, produced a single civilian death. Modern conflicts, however, fought so often in densely populated urban rather than rural areas, take a high toll on civilians. In a survey of people affected by current conflicts published by the ICRC to commemorate the 150th anniversary of the Battle of Solferino, 44% of the respondents said they had personally experienced armed conflict. Almost 30% of those directly affected by fighting said a close family member had been killed during fighting. 56% of the people directly affected by conflicts had been displaced, over half had lost contact with a family member and one in five had lost their livelihood. These figures are dramatically higher in some countries! There are many victims of warfare, whether they are civilians or military or the dependents of those killed, maimed or traumatized in battle. Solferino – through Dunant – has been salutary in engendering an approach that views armed conflict through the prism of humanity. But the humanitarian approach is not only about the promotion of the principles of the Red Cross or international humanitarian law. It is also about the promotion of international norms in support of humanitarian objectives more broadly. This includes prohibitions on the use and production of weapons that cause superfluous injury or unnecessary suffering or, like landmines and cluster munitions, affect civilians and combatants without distinction, and that have wrought so much misery and deprivation on civilians. It means seeing disarmament as humanitarian action and bringing human security perspectives to bear in moving the disarmament agenda forward. The enthusiasm for the cause of the Red Cross/Red Crescent Movement that marked the celebrations in Solferino, and its undertone of empathy with the victims of warfare, shows that the lessons of the past are not always forgotten. This is truly an example of Kipling’s ‘Lest we forget’ , in a practical, not a glorifying sense. 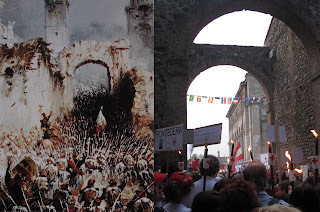 Photo Credit: ‘Perspectives at Piazza Castello, Solferino, 150 years apart’ by Jill Caughley. - Henry Dunant, ‘A Memory of Solferino’, ICRC, 1986. - ICRC, ‘Our World: Views from the Field’, Summary Report, Opinion Survey, 2009.